How to Remove Krab Ransomware? The only method of recovering files is to purchase a unique private key. Only we can give you this key and only we can recover your files. If the .Krab file extension prevents you from opening your files, prepare for bad news. Your device is infected. The nasty .Krab Ransomware lurks in the shadows of your OS and wreaks havoc. This virus is the newest version of the infamous GandCrab Ransomware. .Krab uses trickery to sneak into your system undetected. Once on board, it wastes no time and corrupts your entire OS. The ransomware corrupts essential system folders and files. It modifies your System Registry and alters your settings. This done, and the virus starts a file-encryption process. 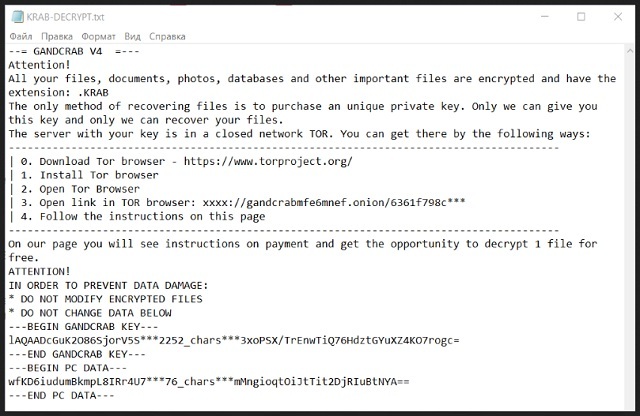 The ransomware follows orders to locate and lock all user-created files. .Krab Ransomware is after your pictures, videos, databases, documents. The virus uses the advanced TEA (Tiny Encryption Algorithm) encryption algorithm to lock your files. In complete silence, the ransomware corrupts your files. When it’s done, it drops a ransom note which explains the hackers’ demands. The note also provides information on how you should pay the ransom. To recover your files, the criminals demand a hefty ransom paid either in Bitcoin or DASH. The criminals give you limited time to do so. If you don’t pay within the time limit, the demanded sum doubles. Do not fall victim to this psychological trick. The hackers want to push you into impulsive actions. Take your time to consider the situation. Paying the ransom is never a good idea. You are dealing with criminals. They won’t hesitate to double-cross you. Your best course of action is the removal of the .Krab virus. Don’t waste your time. Clean your computer before the virus gets a chance to cause more harm! As advanced as .Krab Ransomware is, the parasite relies on your carelessness. The virus lurks in the shadows and waits for you to make a mistake. Do not make its job easier. Do not let your guard down. Parasites like .Krab Ransomware lurk behind torrents, spam emails, and fake updates. Your caution can prevent these methods from succeeding. Don’t visit shady websites. Download your software from reputable sources only. When installing an app, pay attention to the fine print. And, of course, be very careful with your inbox. The good old spam emails are still the number one cause of virus infection. Treat all unexpected messages as potential threats. Before you even open them, take a minute to verify their senders. For example, if you receive an email from an organization, go to their official website. Compare the email dresses listed there to the questionable one. If they don’t match, delete the pretender immediately. The key to a secure and infection-free computer is caution. Don’t ever give into naivety. Always take the time to do your due diligence! You are in a bad situation. Your files are locked, and your computer – corrupted. .Krab Ransomware controls the way you use your computer. It also threatens to destroy your precious files. Be strong! Don’t follow the hackers’ instructions. Do not contact them, and don’t sponsor them. These people are criminals. Their promises are not warranted. More often than not, they don’t fulfill their pledges. Practice shows that the hackers tend to ignore the victims once the ransom is paid. There are cases where the hackers dared demand second ransom. How many times are you willing to pay for your own files? Not to mention that the promised decryption may not work properly. Don’t play games with the hackers. You cannot win against these criminals. Remove the .Krab virus before it causes more trouble. These viruses, more often than not, are spying tools as well. The criminals use them to steal sensitive information such as your personal and financial details. Do not risk it. Remove the ransomware ASAP! Locate any suspicious processes associated with Krab encryption Virus. Krab may have the ability to replicate itself, if not completely cleaned. This may require tracking down hundreds of files and registry keys. You can choose to use Spyhunter Professional Anti-Malware Program to deal with any infection that might be lurking along with Krab!